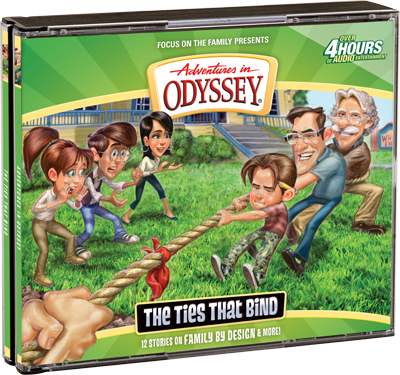 By now, many of you have probably seen the final front cover for the upcoming Adventures in Odyssey Album 58: “The Ties That Bind”. It features a scene that could likely take place in a scene from an upcoming episode, though the illustration is mainly meant to illustrate the overall theme of the audio album. It’s an album addressing the various aspects of family. Scheduled for a Fall 2014 release, “The Ties That Bind” will also be a great tie-in to Focus on the Family’s The Family Project releasing this spring and will open up discussion for families during this critical time. It’s an album dealing presenting God’s design for families and will be a useful tool in the years to come. As always, it’s never been a better time to be an Adventures in Odyssey fan. With the Odyssey Adventure Club entering its fourth month with exclusive episodes and more, great things are happening and Odyssey its making its way to more listeners! The Official Podcast Presents the Avery Awards!